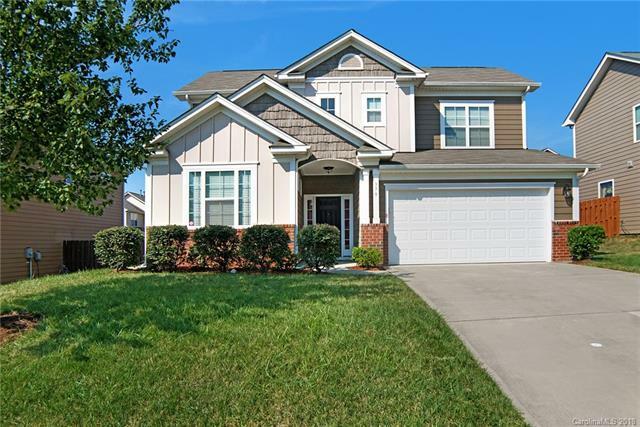 Gorgeous well maintained 4 bedroom/3 bath NE Facing home ready for it's new owners. Gourmet kitchen with granite countertops, tile back splash, 42" cabinets, stainless steel appliances with gas range and huge over sized island perfect for entertaining. Enjoy your morning coffee or relax after a long day in the sun room overlooking the fenced backyard. Neutral paint and hardwood floors in kitchen, foyer, dining area and living room. Surround speakers in living room, kitchen and sun room. Ceiling fans and upgraded lighting in every room. Backyard features an extended patio with concrete all the way around outside of home. Guest suite on main level with full bath. Master bedroom upstairs with large walk in closet. Master bath has dual sinks and tiled shower. Bright upstairs loft is one more feature of this great home. Neighborhood amenities include large pool with lazy river children's pool/splash pad, club house and more. Don't miss out on the opportunity to make this your new home!